It would be a very rare opportunity to watch movies from other country but knowing that it's a Japanese film, I got excited. I have always been fascinated with Japanese culture-their food, music, fashion and even movies. My excitement stopped upon learning that I have a seminar to attend this Saturday and I will meet up with friends for Harry Potter and the Deathly Hallows 2. 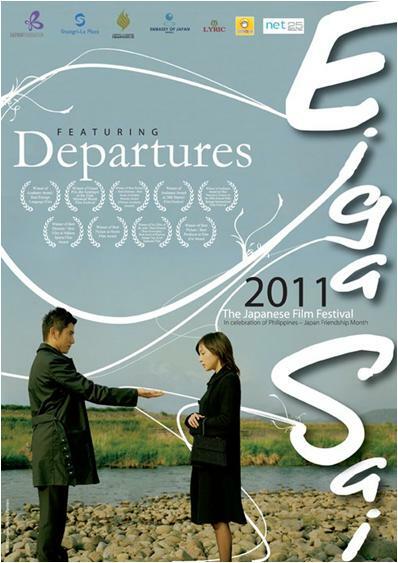 I also learned that the movie, Departures won the Academy Award for Best Foreign Language Film at the 81st Oscars in 2009. It also captured the Japanese moviegoers and made its earnings to almost $61 million. See you there and hope you'll enjoy the movie. I am planning to make a review from it so watch out for it guys. Ciao! Shie, aside from Departures, what other movies are good to see?